It's Official We are Back!! We are back from vacation!! Arrived to work bright and early to get the ball rolling. 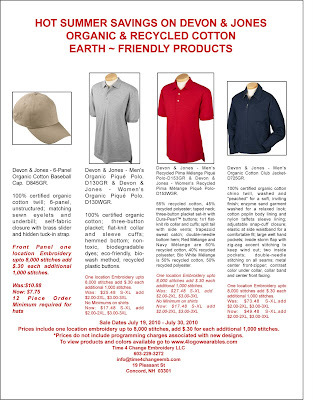 Don't forget to check out the great sales we have going on Devon & Jones Organic & Recycled Cotton wearables until the end of the month. View the flier on Facebook at Time 4 Change LLC or on our blog link www.time4changeemb.com. If you have any questions e-mail info@time4changeemb.com, call,603-229-3272 or stop on by the store. I am almost back from vacation (July 19th official return date) and I have some great deals in store for you as my way of saying Thank You for under standing my taking time off. I am starting out with some great deals on certified organic and recycled products from Devon & Jones. See flyer for sales prices and information. To view the colors available for each of these items please go to www.4logowearables.com Have questions? Call, e-mail or stop by starting July 19th. I will also have a couple of samples here at the store if you would like to see the items, they should be arriving via that special brown truck Monday afternoon.